Besides the rowhouses and apartment buildings, the proposed historic district includes two institutional buildings and a single office building. 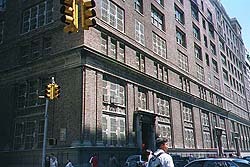 The larger of the insitutional buildings is Washington Irving High School. This is a significant institution in the history of women's education in New York City. It is of additional importance for its exceptional Gothic-inspired public spaces and its extensive series of mural decorations (this interior is proposed for interior designation). 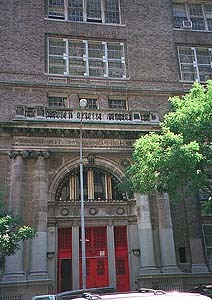 The school that was to become Washington Irving was organized in 1902 as a branch of Wadleigh High School (at the time, the only girls' high school in Manhattan). Known initially as Girls' Technical High School, the institution was the idea of progressive educator William McAndrew, who believed that girls training for vocational or technical trades and those undertaking an academic curriculum should be educated together since they had much to teach each other. The school proved to be extremely successful, with classes held in five different buildings. The increasing enrollment justified the erection of a new building planned specifically for the needs of the diverse female student body. Land was purchased on Irving Place, opposite the building reputed to be associated with Washington Irving, and the name of the institution was changed to honor that great American author. In 1908, Superintendent of School buildings C.B.J. Snyder designed a seven-story brick, limestone, and terra-cotta structure with an imposing arched entrance, paired round-arched Florentine Renaissance windows on the seventh floor, a deep cornice, and a tiled hip roof. The building was to cost $600,000. Two years later the proposed building was enlarged with the addition of another story and a flat roof that would be available for recreation. Construction on the school began in 1911 and was completed in 1913. The school's simple street elevations have a two-story limestone base, with the upper stories clad in gray brick trimmed with limestone and terra cotta. A cornice above the eighth floor is supported by wrought-iron brackets. The planning of interior spaces at the high school was extremely difficult since the school needed a wide variety of facilities for its extensive curriculum: housekeeping, nursing, marketing, care of babies, laundering, embroidery, plain sewing, garment making, costume designing, drawing, illustrating, plain and fancy cooking, entertaining, sanitation, picture hanging, telephoning, dancing, stair-climbing, typewriting, bookkeeping, stebography, salesmanship, office management, bookbinding, cataloguing, commercial filing, printing, photography, gardening, newspaper writing, in addition to the usual high school subjects. All of these needs were to be accomodated in 94 classrooms. It was not until 1932 that design began for an addition to the school. Located on East 16th Street, the 12-story addition, completed in 1938, was designed by Walter C. Martin. The exterior of the original building is extremely simple. The interior public spaces of Washington Irving High School, however, are among the most impressive in any New York City school and should be designated as an interior landmark. These consist of a two-story foyer with a mezzanine balcony, and a large skylit auditorium, all designed in Snyder's favorite Collegiate Gothic mode. They also contain one of the most extensive art projects in a New York City public school, with four separate mural projects and sculpture contributed by two additional artists. In addition to these works commissioned specifically for the high school, a bust of Washington Irving by Friedrich Beer was placed in front of the building in 1935.